Praise/Worship Leader CHISONIA IGE releases debut single ''JESUS YOU ARE BEAUTIFUL''. She is the president of Chisonia & His Presence Crew and has ministered in several worship and praise Programmes within and outside her milieu. She is the pilot and host of the tremendous annual worship event titled 'Festival of Praise' in synergy with the crew members in Benin City. 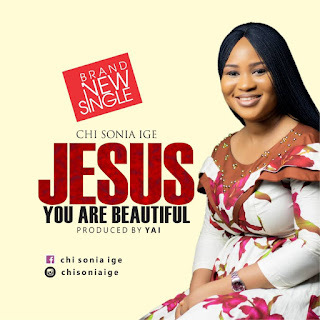 She had just released her long anticipated debut single titled 'Jesus you are beautiful'. A song which expresses the awesome aesthetics, unfading gratitude, magnificent and powerful nature of God in an edifying lyrics and sounds that renders appeal and blistery emotions. The song X-rays the powerful and magnanimous nature of God. According to the songwriter, 'God is amazingly beautiful'. The song however exudes a supernatural atmosphere, mixed with deep and passionate lyrics capable of attracting miraculous bliss. The song is better experienced than talked about.